I approached reading this book with an equal measure of trepidation and thirst for understanding: the former because, as with most of my colleagues, I endured some years of challenging and confusing group process as part of my psychotherapy training, and the latter because I am now facilitating a group within a training, and felt I needed some theoretical support. The book is written by two contemporary British psychotherapists who underwent their group training together. However it is clear from the outset that Nick Barwick leads on the writing, and is supported in conversation by Martin Weegman. The book is helpfully set out in two halves. The first part, ‘Mainly Theory’, provides an excellent overview of the development of group analysis, signposting key theoretical concepts and points of comparison. In contrast the second part, ‘Mainly Practice’, illuminates how some of these concepts come to life in action through a mixture of composite and true case examples. Powerfully, Nick Barwick contextualises his understanding of the value of group analysis within our contemporary socio-political environment, which is becoming ever more insecure (America First, Britain First), suggesting that it is the fears which have arisen from the speed of change which might get explored more fully through group analysis. Following Foulkes’ belief that ‘the therapy group is a microcosm of society’ (p.xxi), the book commences with a historical overview considering the ways in which individual disturbances are reflective of systemic disturbances. Barwick illustrates that whilst group analysis has deep psychoanalytic roots, there is an optimism at its heart which links Foulkes with the self-actualising tendency within the Humanistic tradition. In Chapters two and three, Barwick explores some of the core concepts of ‘what goes on in groups’, considering differing structures and homogeneity, and providing some helpful frames for how groups develop. I particularly liked the models of moving from cohesion to coherence (p.20), emphasising the group’s growing ability to tolerate and embrace difference, and Schlapobersky’s three dimensions of therapy: ‘relational, reflective and reparative’ (p.22). Referencing the relational turn and neuroscience, we begin to see the authors’ own optimism in believing that early sedimented patterns can be repaired through group enactments which offer ‘the immediacy of interpersonal encounter and a corrective recapitulation of early family life’ (p.71). As a text book for trainee group analysts, the book offers much to the ‘conductor’, the group analytic term for the facilitator or the leader. The authors draw upon their creative leanings to give full expression to the analogy of a musical conductor, and give rich examples and cautionary notes on the role of the conductor. Importantly they recognise the need for the conductor to be able to own their power in order to support the group’s process dynamics of ‘resonance’, ‘condensation and amplification’, ‘mirroring’, ‘negative mirroring’, ‘triadic mirroring’ and ‘exchange’. Chapters three and four focus on the myriad ways in which the conductor works within the group. Barwick often references the Gestalt concept of ‘figure-ground’ in exploring the conductor’s role of evenly hovering attention between the individual and the group. He also explores one of the goals of interconnectedness in helping group members to move from ‘monologue’ to true ‘discourse’. Interestingly, in ‘the mother approach’ chapter, Barwick indicates a tension in group analytic theory between a more traditional light-touch Foulkesian approach with a strong emphasis on discourse and Marrone’s greater emphasis on the role of the conductor within the transference, focusing more on affect and behaviour, and the importance of attunement and mirroring. In the final theory chapter, Barwick contrasts Foulkes with Bion, and some contemporary approaches. We again see a tension between Foulkes’ democratising tendency and, in Bion’s more hierarchical model, a recognition of the authority held by the conductor. Barwick draws attention to the idea of the ‘anti-group’ where members engage in destroying the function of the group. Referencing Nitsun and Hopper, we see a strong case for careful selection of group members and a suggestion that the conductor’s own relationship with aggression may affect their capacity to handle anti-group manifestations: ‘Linked to a conductor’s capacity to attune will be his attitude towards aggression. Is it seen as potentially creative or simply destructive?’ (p.111). We see more of Martin Weegman in the second half of the book as we ‘listen in’ to conversations between the authors as they reflect upon their case work. This half is well structured, following the lifecycle of groups from beginnings, through groups in action, to endings. In all, I found this book an excellent and illuminating read. 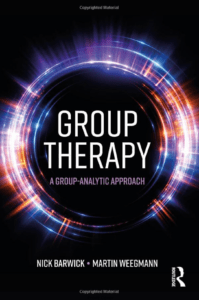 Extensive in its theoretical range, it was great to find a book which brings us up to date with contemporary thinking on group analytic therapy. In a world which feels to be ever more disharmonious, and bent on dissociative coping, this book is a salient reminder of how valuable a tool group therapy can be. Reena Shah is an integrative psychotherapist with a private practice in London and working with a low cost counselling service. She is also a trainer, teaching at the Minster Centre and the College of Haringey, Enfield and North East London. Reena has a particular interest in childhood sexual abuse, and is on the Board of trustees of One in Four, a charity providing counselling for adult survivors of childhood sexual abuse.